Hello! I wanted to pop in and share a card I made using some of the new products from Taylored Expressions! 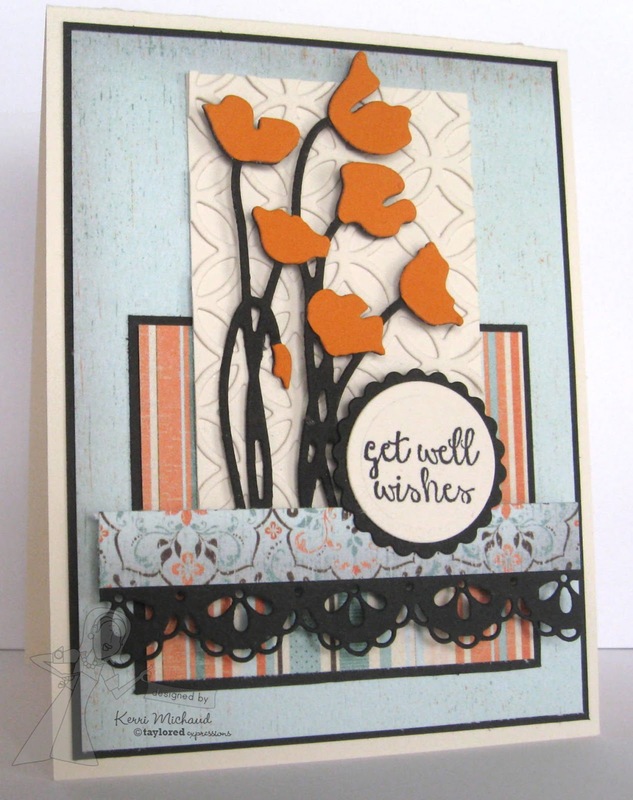 I needed a get well card for a friend of mine, so I grabbed this GORGEOUS new silhouette die called Silhouette Stems 1. I cut the shape out of black and orange card stock, then trimmed the flower heads off of the orange and adhered them to the black. The background was created with the new Circles Cutting Plate which I LOVE and the sentiment comes from the beautiful stamp set~Posh Posies. I also used my favorite border once again~the Lace Chain Border Die. The dp is Authentique Gathering. Hopefully this will cheer my friend up! Well, I gotta go get ready for the day. I hope you have a fantastic weekend! I never tire of coming by your blog for inspiration. Beautiful!